This was Asakura Haruka's singing event for minor idols. I went to see Itou Asuka and the Maru Gaku girls, who were one of the guests. There were around 25 people in the crowd. I stood against the wall on the right side, so I can take photos. Asakura Haruka opened the event with one song. The first guest was Minami Aino, and she sang three songs. The second guest was Sakura Yukoro, and she sang four songs. Then Haruka came out and had a short talk session with Aino and Yukoro. 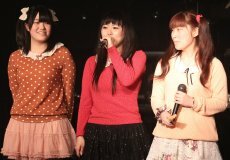 The next guest was Itou Asuka and the Maru Gaku girls. Six of the Maru Gaku girls appeared with Asuka: Amano Miki, Hino Kanako, Ueda Nao, Nishizawa Kana, Yahara Tomoko, and Takayashiki Haruka. Everyone was wearing long sleeve shirts or sweaters over frilly skirts and "over the knee" socks. The Asuka + Maru Gaku stage flowed as follows. During "My Graduation" the girls who weren't singing went off the stage change into their "candy" tank top outfit. For "17 no Natsu" everyone came back onto the stage in their "candy" tank top outfit. The next guest was Kase Shiori, and she sang 3 songs. Miyano Shizu was the last guest, and she sang 4 songs. At the end, Haruka sang 4 more songs. After the event everyone set up tables and sold goods. Asuka and the Maru Gaku girls sold two 2L sized photos for 1000 yen. I brought my 60D and EF70-200F2.8L lens, and took around 1200 photos, with about than 440 worth keeping.